Years ago, in the wild west days of Kinja a person could start a sub blog to cater to their automotive niche passions. Well the wild west is a place that’s ideally suited to the overland life and so Overland.kinja.com was born. 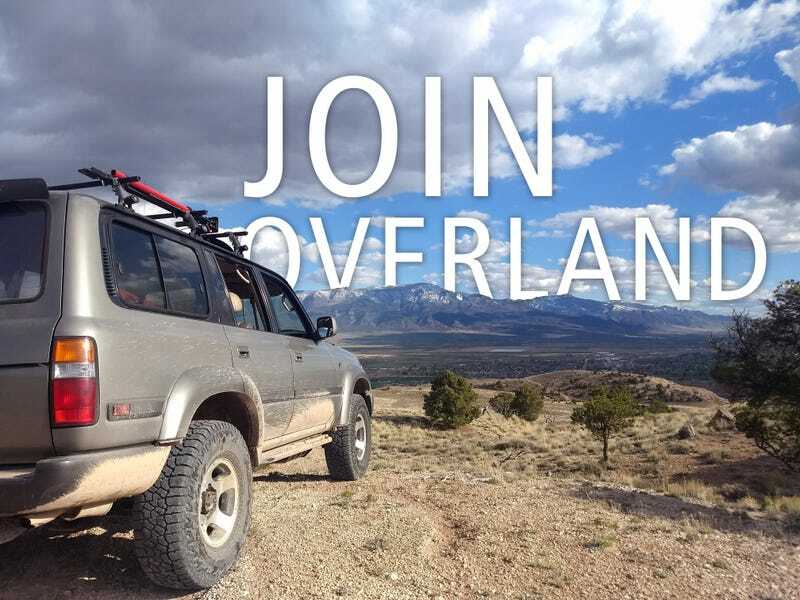 While the term “overlander” has certainly picked up a special stigma all its own as the popularity of vehicle based adventure travel has exploded in the US the folks at O&E like to think of it less of how much crap can you bolt to your truck and more about helping each other learn, supporting each others adventures and enabling responsible 4 wheel drive and camping fun. For a long time membership was available to anyone who wanted it, but it was rarely encouraged and, if I’m honest with myself, I’ve been very lazy about getting around to requests and I feel that I may have let many slip through the cracks in the process. In the past I’ve also been extremely selective about requests - This place has always been full of some of the coolest people I’ve met on the internet and some in real life and I want that to continue - but I also want to encourage the people who are on the fence, or who want to do cool vehicle based adventure travel but don’t feel like they are full “overland”. Weekend warriors, newbies, people who want to know more, get started or take it further. I figure the popularity of exploring the natural world by vehicle isn’t going away and we might as well be an add free, membership free, bias free source for knowledge, support and encouragement. So here’s how it works. If you want in, post a link in the comments to something you’ve already posted (to your own blog, or another kinja) you think would fit in well here and I’ll get you added. The one thing that I ask is that anyone who requests authorship here not do it as a token effort or a means to rack up some sub blogs in their drop down menu. Please contribute where and when you can. Cool hike you did? Post it. Mods to the vehicle? Post it. Questions? post em. Read something cool about the outdoors? Give us an editorial take on it, please, we’d love to hear about it. If you remember and liked Indefinitely Wild, an official kinja sub blog on the outdoors, you’ll probably find a home here. O&E doesn’t have any codified rules because we’ve never needed them, and I hope that continues. As of right now there is only one admin - me - for the same reasons. What that means is that if you are doing something not cool, you’ll hear about it and if you keep it up you won’t be here long. Let’s hope that’s not the case. Also please bear in mind that sharing is caring and while sharing to and from other sub blogs (oppo for example) isn’t discouraged we ask that you respect the other sub blogs and this one to not only post on your own blog and share, or only on oppo and share or overly share from here. Also, if you’ve got friends that aren’t on the Kinja but are in your wheeling group or think might like it here, send em our way, at the very least we’ve get them ungrayed and contributing and hopefully added to the fold in short order.